It’s a known fact that we will go see anything starring Zac Efron. Plot? Doesn’t matter. His newest movie, “We Are Your Friends,” hits theaters next week. Zac plays an aspiring DJ who just needs that 1 track to make it big time. In honor of the new film, here’s a look at some of Zefron’s greatest roles. Zac’s first major role, alongside Jesse McCartney and Danielle Panabaker. Seriously, what do we need to do to get this show on Netflix or Hulu? One of the greatest musical numbers of all time. This movie has the 3 essential ingredients of a successful Zefron film: dancing, basketball, and (un)necessary shirtless scenes. The only thing better than a Zefron movie is one that also stars Dave Franco! Look out for the sequel next year. We love that Zac & the cast promoted the movie with screenings and after-parties across the country, giving the fangirls what they want. It’s boyband week over at Billboard.com, AKA the greatest thing ever. Every week should be boyband week. In honor of the occasion, Billboard staffers held a fantasy boyband draft, assembling their dream teams. For this week’s Friday Five, we decided to get in on the fun and do our own boyband draft and create 2 super boybands: J5 and *Big Time Boys on the Block°. The only rules were that you can’t pick 2 members from the same band. Check out our picks and vote for your favorite! Just watch this performance from The Main Event Tour, and you’ll know why Joey is the MVP of any boyband. Those vocals. Those moves. Those abs. We knew James was a national treasure during Big Time Rush’s run, but he further proved it in his run to the final 3 of “Dancing With The Stars.” Enjoy. Jeff has had the most uh, interesting post-boyband career. He brings the moves for sure. Fun fact we somehow just discovered: He was part of a “man band” on VH1 called “Sureshot” with Chris Kirkpatrick, Rich Cronin and Bryan Abrams in 2007. The most underrated former boyband member (Dreamstreet!). His last single, “Punch Drunk Recreation,” and the accompanying video (where J Mac basically leads his own boyband) have not gotten nearly enough love. Nick has had his struggles in the past but he overcame them and continues to BRING IT every night on stage giving 110% during every show. He also likes to make up his own moves on stage which is always A+ in my book. Do you watch NKOTV every week on A&E? NO?? You should. It’s the greatest night for television and you’ll see why Donnie Wahlberg is my top pick for boyband. He knows how to treat the fans, he’s great to his wife (secret fangirl: Jenny McCarthy) and his family. Plus – watch this video for further proof of A+ boybanding. Another former boyband member who has a TV show about his own restaurant (“Raising The Bar” on A&E every Wednesday night.) Let’s face it, Nick Lachey was the best looking member of 98* and he’s been the most successful – aside from Jeff Timmons’ stripper revue. Kendall has seamlessly transitioned into boyband member to acoustic singer-songwriter while not alienating any fans from either end of the spectrum. He’s got a good voice, and whether he wants to admit it or not – this boy can DANCE! Plus, he’s got great hair. He appeared on Hannah Montana, dancing with the stars, various food critic reality shows, and he’s still the most underrated member of *N SYNC. Let’s not forget that Joey was also in “On The Line” with Lance. Taylor Swift wrote an outstanding piece in the Wall Street Journal over the summer about the future of music, where she wrote that “people are only buying [albums] that hit them like an arrow through the heart or have made them feel strong or allowed them to feel like they really aren’t alone in feeling so alone.” We couldn’t have said it better ourselves. Here are the albums in 2014 that hit us like an arrow through the heart. It’s rare and special to find an album where you listen to each and every song, and can sing along to from start to finish. This album was by far our most played of the year, and the soundtrack to our 2014. We’ll be able to look back at this year as “where it all began” for Dan + Shay, who have a very, very bright future ahead of them. We can’t wait to see what’s next for the talented duo, starting with their 2nd major headlining tour in 2015. We were lucky to have downloaded a copy of the “Behind The Pines” mixtape before Sam exploded over the summer with the release of his hit single “Leave The Night On.” He released his full length debut, “Montevallo,” in October, opening at the top of the country charts, and third overall. Sam’s unique style makes us excited about music. His blend of a 90s R&B sound with country storytelling blends perfectly with Sam’s southern drawl, deep voice, and spoken lyrics. He’ll be selling out arenas one day. A sophomore album is always tricky, especially when your debut was nominated for a Grammy and countless other awards. But Hunter managed to knock it out of the park. The album is a more collaborative effort than his first, on which he played every single instrument. Hunter’s music grabs you from the first listen. We love how Hunter brings this album to life on tour, with unique arrangements for each song. He’s the rare musician who makes his live show a full experience that stays with you long after the show. “Snapshot” is another debut album that immediately got our attention and made us wonder where The Strypes had been all our lives. Evidently they’d been honing their skills at pubs across their native Ireland, where they learned to play loud, fast aggressive, and just damn good old fashioned rhythm and blues. And they’re all still in their teens. There are no filler songs on the album – it’s solid from start to finish. If you ever have the opportunity to see The Strypes live, don’t miss it. Seeing the album come to life on stage was one of our favorite moments of the year. Technically this is an EP, but at 8 tracks, it’s *almost* an album. We fell for Austin’s sound with tracks like “What About Love” and “Banga Banga,” but this EP, with it’s 90s pop influences, cemented Austin’s status as the one man boyband. We’re obsessed with the Britney and *NSYNC-esque slow breakdown in the title track, “Secret,” and couldn’t stop listening to “Next To You” on repeat for days. Austin’s working on his much awaited full length debut with the legendary Max Martin (who wrote basically every great 90s pop song you can think of), and we can’t wait for more! Possibly the most underrated album on this list. His newest single, “Punch Drunk Recreation,” is a pop masterpiece. Armed with a Justin Timberlake sound, and retro look, JMAC outdid himself with this album. “In Technicolor” is one of those albums that will always be in style. We admit that we’ll probably love anything that involves our favorite boybands – especially when two of our favorite members team up. But Nick Carter and Jordan Knight’s album is a fun R&B/pop album worth checking out. It’s a safe bet that 5SOS are going to be extremely monumental in bringing pop punk back to a radio station near you! We’ve had the band’s debut album on heavy rotation, and we don’t think we’ll stop playing it any time soon. Also, can people please stop referring to them as a “boyband?” These guys have the heart, drive, and sound to be restore Warped Tour to the glory days of 2006. While we had to wait for this album to be officially released in the United States, it was worth the wait! The Vamps have an acoustic pop sound that makes you want to dance around your living room singing at the top of your lungs. With it’s December release, Walk The Moon’s sophomore album “Talking Is Hard” barely made our list. The Ohio band celebrated by live tweeting with fans the first listen of the album, divulging secrets like “there’s a mess up in this part of the song” to “the weird lyrics are from this member!” Walk The Moon are taking the album on a full headlining tour in the spring. It’s not too late to hop on the dance jam bandwagon. Be sure to follow Secret Fangirls for more updates! NYC’s THE HEYDAZE are one to lookout for in 2015. Since forming earlier this year, they’ve opened for Jesse McCartney and Timeflies, and had a sold out headlining show at Webster Hall. The band crafts extremely catchy, feel good pop music that anyone can enjoy – the kind of music you want to play driving around with the windows down and the stereo up, singing along at the top of your lungs. We sat down with THE HEYDAZE at Webster Hall before their last stop on Timeflies’ After Hours Tour and talked about everything from how they met to what music they grew up listening to. The band is just as fun as their music. Watch our interview below! You can see THE HEYDAZE in NYC at Gramercy Theatre on December 19th! Trust us, you don’t want to miss this. Get your tickets now! Check out THE HEYDAZE on Soundcloud and Facebook and pickup a copy of “Don Juan” on iTunes! The single is from Jesse’s latest album, “In Technicolor,” which is one of our favorite albums of the year. The album’s retro-pop sound is a slight departure from J Mac’s previous albums, but we think it’s his best work yet. Watch the video for “Punch Drunk Recreation” below! The dance moves are ON. POINT. Pickup a copy of “In Technicolor” on iTunes or Amazon now. Be sure to follow Jesse McCartney & Secret Fangirls for more updates! Jingle Ball concerts are one of our favorite Holiday traditions. What better way to ring in the season than an evening with some of your favorite artists? 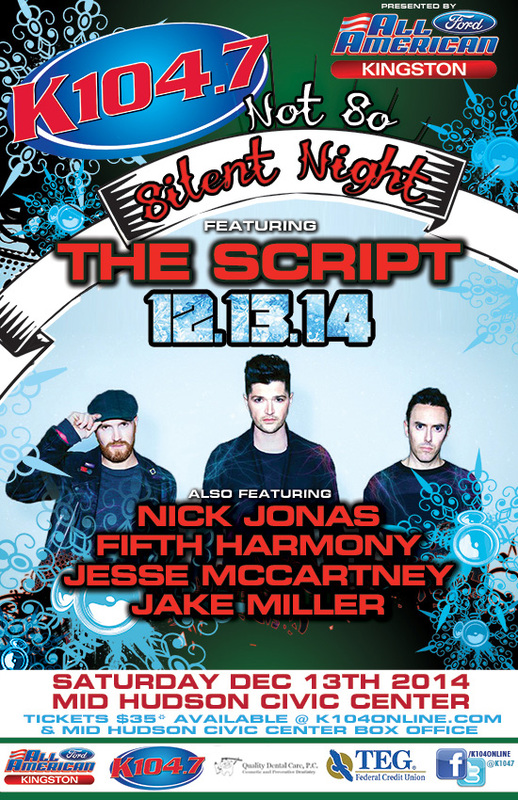 New York’s K104.7 just announced the lineup for their “Not So Silent Night” bash on December 13th. Secret Fangirl favorites Jake Miller, Nick Jonas, and Jesse McCartney will all be performing, along with headliners The Script and Fifth Harmony. Here’s a throwback to Nick Jonas singing “Girl of My Dreams,” although it’s safe to say he will not be performing this song. Be sure to follow K104.7 & Secret Fangirls for more updates! It’s hard to believe that we’re already nearing the end of summer. (Seriously, how is Labor Day next weekend?!) Which means you’ve got just a couple weeks left to find (or enjoy) that summer romance. Here’s the soundtrack to your summer love. This nostalgic track paints the picture of a perfect summer romance. From sweet tea kissin’ to that first dance in the sand, just listening to this song makes you feel like you’re spending a hot day on Myrtle Beach back in 19–. We’re loving the retro-pop vibes of JMAC’s new album, “In Technicolor.” A great love (or a great love song) will make you feel like you’re 17 again. This catchy track is everything you’d want in a summer romance, and will have you dancing in the mirror and singing in the shower. Okay, so this is more of a love song to summer itself and an ode to being on vacation. A reminder that you’ve got 2 weeks of summer left: use them well.